Get up close and personal with sharks in the Dubai Aquarium Shark Encounter. It’s a surreal experience – watching these top predators approach the cage for their food and then for the instructors to feed it to them by hand! It’s something you definitely don’t want to miss. 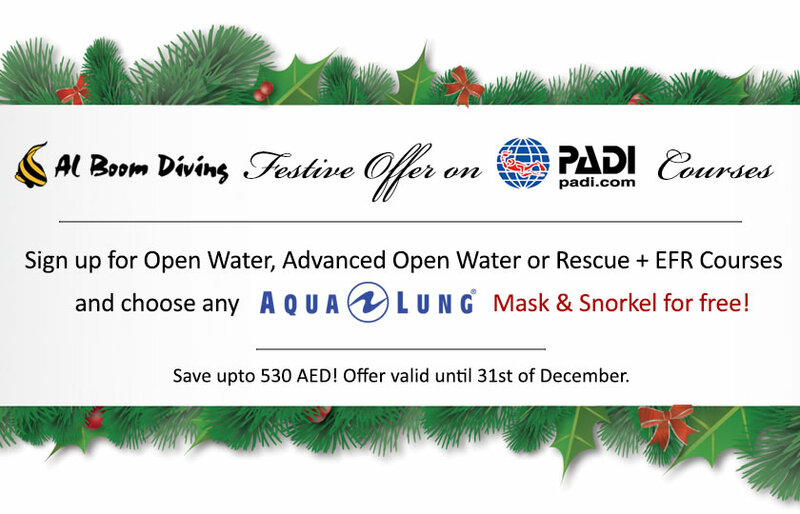 It’s thrilling, it’s safe and it’s for everyone. Come face-to-face with some of the ocean’s most fascinating predators, and witness the feeding frenzy from the safety of our cage. For the first time, you don’t need diving experience to get up-close at feeding time, in a brand new shark feeding encounter. 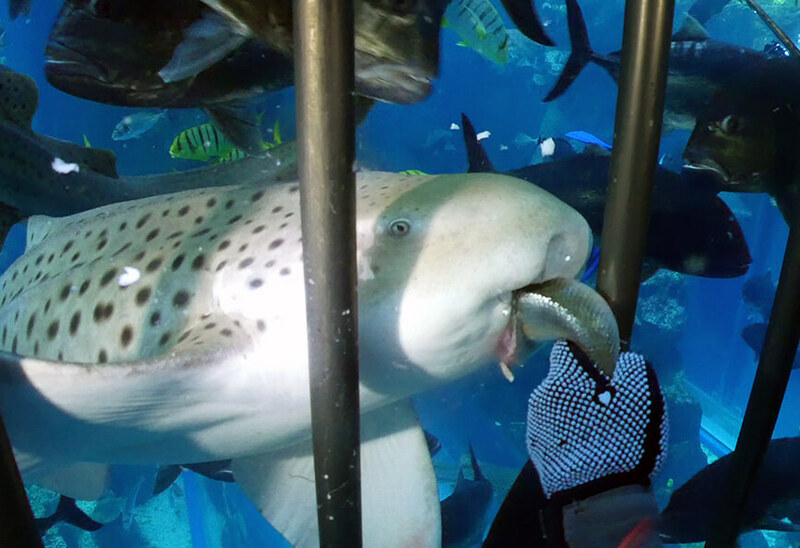 Whilst you are safely enclosed in the diving cage, the Dubai Aquarium Shark Feed Divers will lure the sharks toward the enclosure with buckets of fish, bringing you just centimeters away to witness the feeding frenzy in an interactive and educational experience. 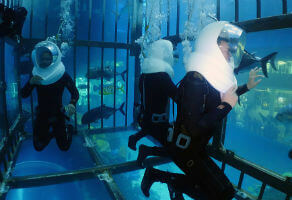 This is the first time that non-experienced divers have been able to enter the shark feeding arena. 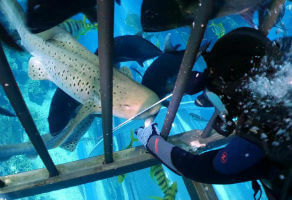 Following the 30-minute underwater experience, guests are taken on a tour of the back-of-house facilities, including the feeding of shark babies and learning about the Aquarium’s shark breeding programme. This close encounter, takes you face-to-face with the commonly misunderstood creatures, which play an integral part in the marine ecosystem. The shark conservation programme at Dubai Aquarium & Underwater Zoo aims to dispel the stereotypes surrounding sharks, whilst educating people and raising awareness of their importance in the wild, their numbers continue to decline. 30 minute briefing followed by a 25 minute Shark Encounter. Session is at 2.00pm daily. Minimum age 12 years old. Medical form must be completed. Click here for medical questionnaire. Guests need broad shoulders, at least 33cm. Guests should arrive 45mins beforehand.